The Opposite of Worry is now available in paperback, kindle, nook, and audio! 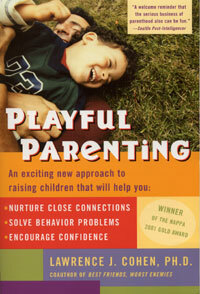 The audio version of Playful Parenting is also available. Playful Parenting means joining children in their world of play, focusing on connection and confidence, giggling and roughhousing, and following your child's lead. Lawrence Cohen, PhD, is a psychologist, author, and consultant living in Brookline, MA. He is the author of Playful Parenting, an award winning book about nurturing close connections, solving behavior problems, and encouraging children’s confidence. Playful Parenting has been translated into more than ten languages. In addition to his work with children and parents, he consults with schools, after school programs, and corporations, and has a general psychotherapy practice. Along with Michael Thompson and Catherine O’Neill Grace, Dr. Cohen is the author of two books on children’s friendships, popularity, and social cruelty: Best Friends Worst Enemies and Mom They’re Teasing Me. Learn more about The Art of Roughhousing, co-written with Anthony DeBenedet, MD. His newest book is The Opposite of Worry: The Playful Parenting Approach to Childhood Anxieties and Fears.